Introducing readers to the man that Stephen King calls "the father of modern horror" is no small task, especially given the restraints of a column, so please forgive me in advance if this explanation of the life, works, and influence of H.P. Lovecraft barely scratches the surface. I'd be doing us all a disservice to pretend to be an expert on the reclusive turn of the 20th century author. Far greater intellects than I have devoted themselves to the study and understanding of this extraordinary writer, whose visions of a cosmos filled with monsters, aliens, and indifferent Gods has touched every corner of modern day science fiction and horror. Consider this a doorway to explore into the worlds dreamed up by a gifted if troubled mind, ones fraught with terrible wonder and secrets so overwhelming they literally leave many of Lovecraft's protagonists stark raving mad at their revelation. While there is more than enough material to spend months covering him and his life, I've decided to break this into a three part series focusing on Lovecraft, the Cthulhu Mythos, and the Necronomicon. Let's start with the progenitor himself. Howard Phillips Lovecraft, or H.P. Lovecraft as he would later come to be known, was an American horror writer who was practically unknown in his time, only published in pulp magazines, and died in abject poverty despite coming from a very wealthy family. H.P. was a classic Anglophile who could trace his roots back to Massachusetts Bay Colony in 1631 on his mother's side and 15th century England on his father's. Often called a product of his times, whose admiration for the ideals of the 18th century gentleman arguably belied a streak of racism and xenophobia, Lovecraft was above all else a sensitive recluse. It was perhaps because of this that he created a new mythos of horror that reimagined the entire genre, taking it away from the gothic constraints of his childhood idol Edgar Allen Poe, and influencing generations of future writers, filmmakers, video game designers, artists, anime scrip writers, musicians, and even boardgame creators in the process. Writers like Stephen King, Clive Barker, William S. Burroughs, Neil Gaiman and countless more have all confessed to being pulled under Lovecraft's hypnotic spell. Legendary horror director John Carpenter's "The Thing" is an homage to Lovecraft's "Mountains of Madness," if not an outright rip off. 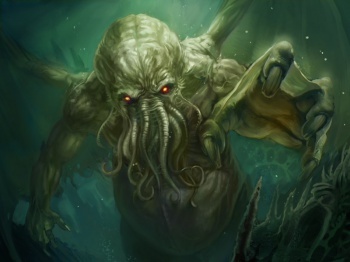 Lovecraft's impact can also be clearly seen in blockbuster movies from "Alien" to "Predator" and even "Pirates of the Caribbean" in the tentacle-faced Davy Jones. Metallica, Black Sabbath, Artic Monkeys and other musicians have written songs that pay tribute to his legacy as well. Chaosium's role-playing game "Call of Cthulhu" has been in print for over 30 years now and is still going strong. Chiaki J. Konaka, an acknowledged disciple of Lovecraft, is credited with spreading his influence among his anime base. The list goes on and on. H.P. Lovecraft is now regarded as one of the most significant 20th-century authors in his genre, but to really understand Lovecraft you have to know his background, since it directly contributed to the creation of his vast and sprawling fictional legacy nearly every step of the way.